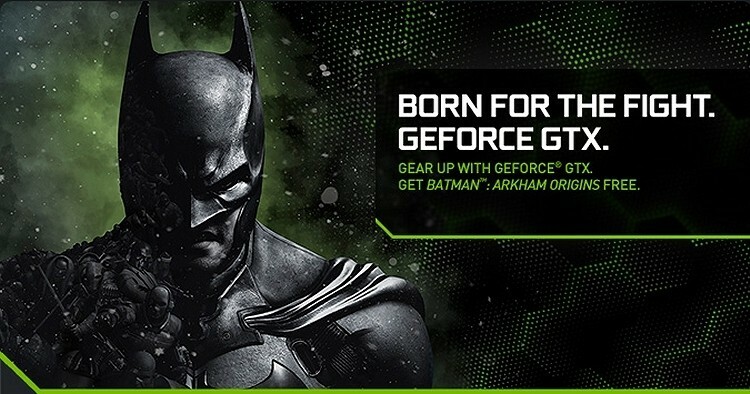 Nvidia has partnered with Warner Bros. to provide a free digital copy of Batman: Arkham Origins with the purchase of any qualifying GeForce graphics card through participating retailers including Amazon, Newegg, TigerDirect and NCIX. Such a bundle isn’t unheard of as Nvidia has bundled other games – most recently Tom Clancy’s Splinter Cell Blacklist – with their graphics cards in the past as an added incentive. The game will take advantage of a number of technologies including DirectX tessellation, HBAO+,Nvidia TXAA antialiasing, soft shadows and various Nvidia PhysX engine environmental effects – making it an ideal choice for a high-end GPU bundle. Gamers will also have access to Nvidia GeForce Experience technology which offers one-click settings optimization and game-ready driver support. Support for Nvidia Shield is also included, we’re told. Cards that qualify for the free game offer are as follows: GeForce GTX 660, 660 Ti, 670, 680, 760, 770 and 780. Nvidia said a tech trailer and an article covering the Nvidia and PC-exclusive technology used in the game will be released on September 2. Batman: Arkham Origins is slated for release on October 25 for Xbox 360, PlayStation 3, Wii U and PC. Currently there are no plans to bring the title to the Xbox One or PlayStation 4 although a mobile version known as Batman: Arkham Origins Blackgate is in development for the PS Vita and Nintendo 3DS / 2DS. Are you planning to pick up the latest in the Batman franchise?